Kirihara (キリハラ) is an SSB4 Rosalina & Luma player from Tokyo, Japan, and is considered the best Rosalina player in the country and the 3rd best in the world, after Dabuz and falln. Kirihara is currently ranked 6th on the JAPAN Power Rankings and 28th on the Panda Global Rankings 100. He has taken sets off of top players such as ZeRo, Larry Lurr, KEN, VoiD, Elegant, Abadango, komorikiri, ESAM, Shuton, Tsu-, and Raito. 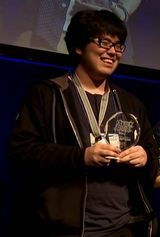 At Frame Perfect Series 2, he became the 2nd Japanese player to win an American national, after Abadango's Pound 2016 victory. Kirihara's style of Rosalina is differentiated by his calculated, aggressive spacing, foregoing the typical defensive style often demonstrated by other Rosalina players. He relies on well spaced aerials to establish stage control, and utlises Luma to full effect as an aerial deterrent, due to Luma's delayed hitboxes. His utilisation of Luma extends to pressure situations, as Kirihara will often employ Luma's moveset to force opponents into shield, discourage approaches, or as a form of option coverage. Luma aids in Kirihara's ground game as well, not only as a deterrent, but as a confirm option, often utlising Luma's jab as a lead into grabs. Despite his adeptness with Luma, he displays little reliance on it, and has proven capable and aggressive, even without. During these situations, he relies on his ability to react to his opponent's heightened aggression, generally encouraged by Luma's absence. Another aspect of Kirihara's playstyle is his exceptionally proficient edge-guarding. He has demonstrated a distinctive ability to react to his opponent's recovery options, and cover them appropriately. He will often follow his opponent's offstage, and attempt to pressure and gimp them in the process. Kirihara's utilisation of Luma extends to his edge-guarding, as he often uses Luma's large and disjointed hitboxes to catch recoveries below the ledge, or to snipe players offstage from afar. As well, his ability to react to his opponent's ledge options, and force them back offstage further contributes to his aggressive offstage play. Kirihara is the only smasher to have a positive record over ZeRo in Smash 4 that is better than 1-0, holding a 2-1 record over him.